Welcome to our home and the area that we live in - Penrhyn Llŷn - Llŷn Peninsula. This area, warmed by the gulf stream, is reknowned for its own micro climate, which is often different to the television weather forecasts. Relax with Phil & Meinir and our children on our traditionally run family farm in the picturesque village of Llangian, one and a half miles away from the well known water sport centre of Abersoch on the Llŷn Peninsula, North Wales. All the family speak Welsh as our first language. We're located only one and a half miles from Abersoch beach and one mile from Hell's Mouth, the finest surfing beach in the whole of Wales. Sorry, but as a working farm we cannot take any pets. Bwlchgroes, the bunkhouse, static caravans and campsite all now have wifi. 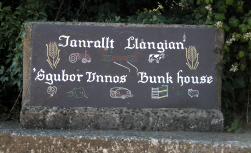 Sgubor Unnos (The Bunkhouse) is the first of its kind to be opened on the Peninsula and for those looking for a high standard, quality budget accommodation for activity holidays at really affordable prices (or a few stress free days to recharge your batteries) then Tanrallt is definitely the place for you. B & B here means Boots, Bikes and Sailboats welcome - more information. Tanrallt Caravan Site is an AA three-pennant listed site, a small family site with an excellent range of facilities. 2 Static caravans are also available - more information. Cerrig Llwydion sleeping up to 4 more information. Bwlchgroes Isa sleeping up to 6 - more information. Bed & Breakfast accommodation is also available - please ask for more information.